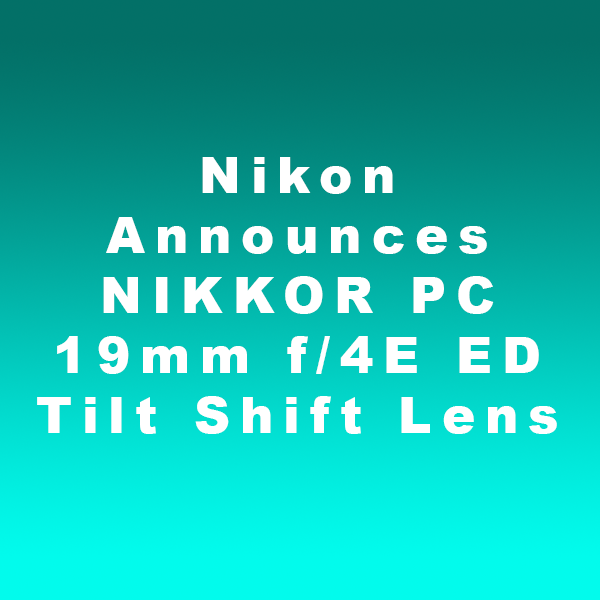 Nikon announced the release of a new tilt shift lens at the end of last year. It is the first new tilt shift lens in its line up in many years, and it has gotten outstanding reviews. The highly anticipated NIKKOR PC 19mm f/4E ED tilt shift lens is the widest perspective control (PC) lens on the market. It is also easier to use then its predecessors because the tilt and shift mechanisms can be adjusted independently from each other, eliminating the need for lock operation. The NIKKOR PC 19mm f/4E ED Tilt Shift Lens is largely intended for professional architecture and interior photographers. Although landscape and fine photographers will also appreciate its superior optical performance and the widest angle of view. It is important to highlight that the new lens will not work with all Nikon bodies. Specifically, when used with cameras other than the D5, D4 series, D3 series, D810 series, D500, or Df, photographers won’t be able to use some combinations of shift and rotation because the lens comes into contact with the camera body. In addition, due to the NIKKOR PC 19mm f/4E ED’s electromagnetic aperture feature, the lens can’t be used with D2- or D1-series, D200, D100, D90, D80, D70-series, D60, D50, D40-series, or D3000 digital SLR cameras, film SLR cameras, or Nikon 1 series cameras. The NIKKOR PC 19mm f/4E ED is available for pre-order. The retail price is $3,396.95.